The Msgr. William Noé Field Archives and Special Collections Center has installed a new exhibit in the cases facing the Walsh Gallery. Comprising recent acquisitions of objects in the Archdiocese of Newark collections, varied pieces related to bishops, priests and parishes illustrate the rich and varied history of the Catholic Archdiocese for which Seton Hall is the University. In the bishops’ case there are pogs commemorating Pope John Paul II’s visit to New York and New Jersey in 1995 along with a scarf and medals for the Jubilee year 2000 under Archbishop, now Theodore Cardinal McCarrick. 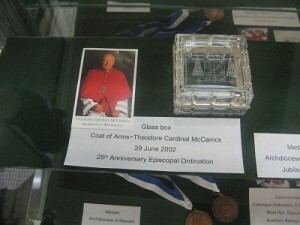 There is also a glass box celebrating his 25th anniversary of episcopal ordination when he became a bishop. Archbishop Emeritus Peter Leo Gerety who this past summer celebrated his 100th birthday making him the oldest bishop in the Western Hemisphere received the Humanitarian of the Year Award from the Sr. Rose Thering Endowment in 2000 which can be seen along with several pins and buttons from St. Patrick’s Day parades, Cathedral masses and related to the Holy Name Society and the World Trade Center. The second case contains materials related more to priests and parishes from Rev. J. A. McHale’s police chaplain’s badge and identification to playing cards observing the Sesquicentennial [150th Anniversary] of Holy Trinity Parish, Hackensack and a T-shirt honoring the annual Feast of St. Gerard celebrated by the parish of St. Lucy, Newark. The exhibit can be seen any time the Walsh Library is open from the hallway between the Walsh Gallery and the Msgr. William Noé Field Archives and Special Collections Center on the ground floor of the Walsh Library. For hours please visit the Library’s home page.